My coming here for this experience is a ginormous risk for me; a lot of mixed up feelings. Will I fit in? Will it be fun (will it be the anti-fun?) What if we don’t like each other…or…what if we do? Normal pondering of trepidation before meeting someone for the first time I think. I also was excited! NUNS! SPIRITUALITY! COMMON PRAYER! NIGHT TIME CARDS! I’ve been painfully out of my element, where I feel most at home, and thrive. I truly couldn’t wait to be back in the women religious culture. And…I was a little sad. Moving toward another community means I’m also journeying away from my former community…cognitively, I can say, “oh, that’s healthy, that shows progress, that’s positive movement in the grieving process….”. On the inside, what’s real…doesn’t speak the language of my head. As much as I only wanted to take the excitement with me, the others have a place in this experience too (growth and all that stuff…) So, I piled trepidation, excitement,and a tiny coin purse of sad into my suitcase…got on that boat and sailed across the lake to experience and notice. A few observations I had when I planted my feet on Michigan soil and put one in front of the other to begin this experience were…peace, acceptance, and welcome. 1. The sisters gave me a journal. On the back, there was a sticker of the painting of Dominic and Francis embracing! OY! 2. 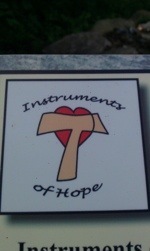 On their motherhouse grounds, there is a meditation walking path called Instruments of Hope…the journey of ST. FRANCIS OF ASSISI. 3. The first slide of the speaker’s PowerPoint presentation FOR THE ORDER OF PREACHERS, was “always speak the Gospel…use words if necessary” and in fades a picture of…that’s right…not Dominic, but Francis. Ummmm…ok. Interesting start. Clearly the sprit is speaking in her subtle ways. I have more to unpack with today and all that’s swirling, but I think I need to take a few steps back and talk about discernment and what this all means for me in my journey….stay tuned…very soon, I promise! Oh….I guess there was one more thing, but I didn’t want to lose the Bonaventure moment of a Trinitarian moment…I’ll let the image speak for itself…. Oh yeah, sure does have me labeled as an OP….hmmmm what is the spirit trying to say? We’ll have to see what Day 2 brings.. This entry was posted in experience, real.truth.experience.joy and tagged call, discernment, franciscan, grand rapids Dominicans, spirit by klafond17. Bookmark the permalink. Oy indeed! Wow, this is exciting, Katy….